This photograph was taken at the November 20, 1934 rally at CCNY. 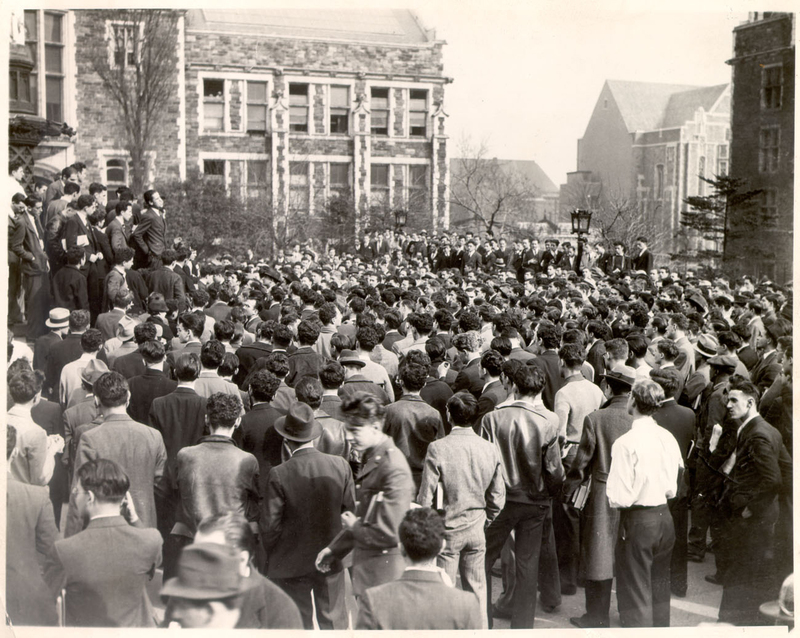 The demonstration was held to demand the reinstatement of twenty-one expelled students as well as the removal of college president, Frederick B. Robinson. The twenty-one were expelled following an anti-fascist rally on October 9th. At the far left side of this photograph, the students are standing atop the pedestal of the campus' main flagpole. The demonstration pictured had commenced with students hoisting a banner emblazoned with the word "STRIKE" up the fifty-foot pole. The protest began at 11am and lasted approximately two hours, attracting a crowd in upwards of 1,500 students. Due to its size, the event ultimately moved out of the area seen in the photo to the nearby Jasper Oval. By event's end, three students were reported to have been arrested during a clash with police and a two-headed effigy of CCNY President Robinson and Italian Prime Minister Benito Mussolini was burned. Cite This document | Unknown, “Rally on CCNY Quad, November, 20, 1934,” CUNY Digital History Archive, accessed April 19, 2019, http://cdha.cuny.edu/items/show/4032.